The wolf ran as fast as he could, taking the shortest path, and the little girl took a roundabout way, entertaining herself by gathering nuts, running after butterflies, and gathering bouquets of little flowers. It was not long before the wolf arrived at the old woman’s house. He knocked at the door. Tap, tap. The wolf pulled the string and the door opened, and then he immediately fell upon the good woman and ate her up in a moment, for it been more than three days since he had eaten. 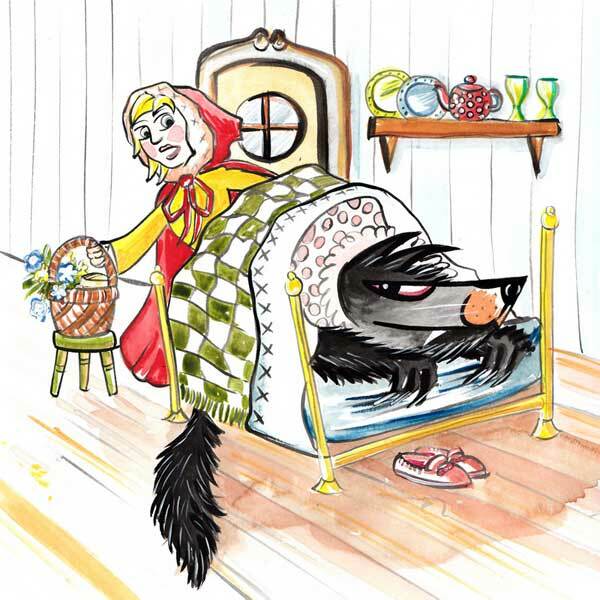 He then shut the door and got into the grandmother’s bed, expecting Little Red Riding Hood, who came some time afterwards and knocked at the door. Tap, tap.